Facebook post engagement, something that most digital entrepreneur struggle with at the beginning. 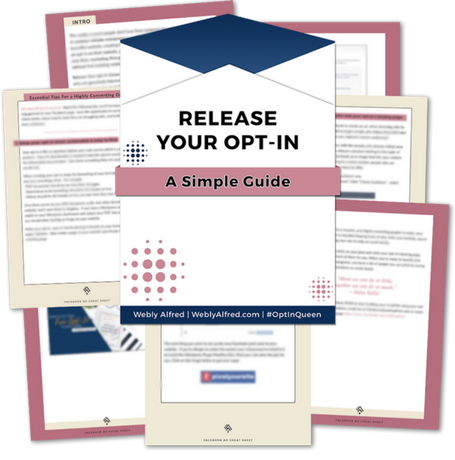 Not interested in being a Facebook ads expert while feeling you’re making a mistake on your Facebook page? Yes, Facebook ads do drive traffic to your page using audience targeting. But if you are just starting out you might not have money to invest in ads. If you are on a budget, have I got good news for you. 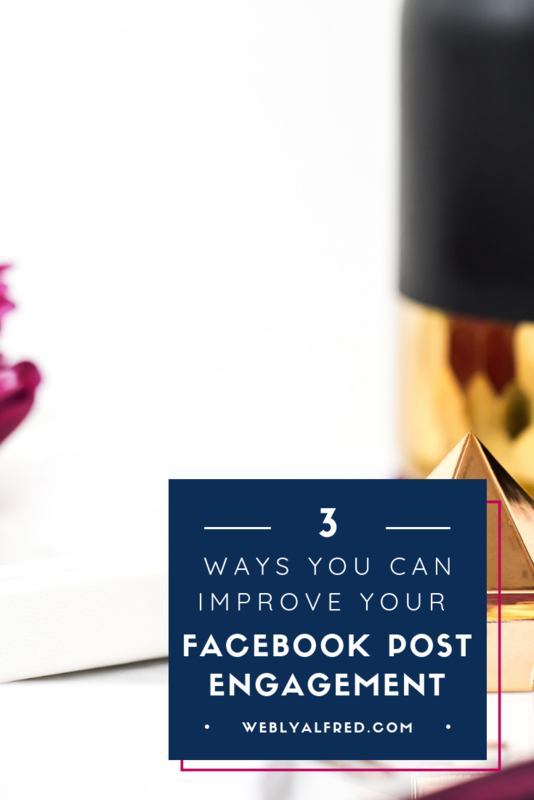 Today, I am showing you three ways to improve your Facebook post engagement without spending a dime on ads. People can get overwhelmed when you tell them “go here, do this.” They love when you show them exactly how to do something, and they get to see the result. They are looking for that result so being able to watch someone show them how to get there is motivating. It makes them want to share, and it’s easy to understand. 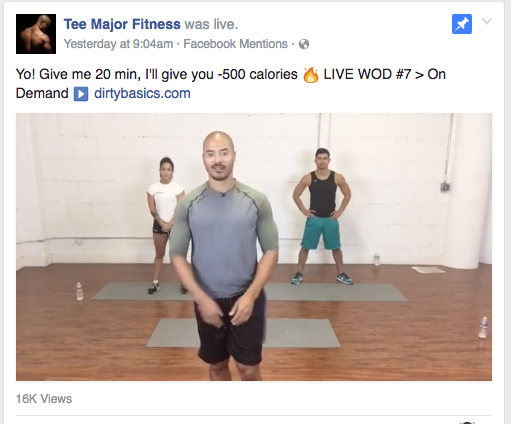 Tee Major Fitness uses live videos to complete 20-minutes workout sessions on Facebook live to encourage their audience. They show people how easy it is to complete a quick workout every day. Every year my son’s school has picture day the second week of school. I always forget and run to the local Gap for last minute clothes shopping. This year the clerk who was helping me went above and beyond. She worked hard to help me save money while still making my baby look super handsome for picture day. I was so pleased that I gave Gap a shout out on Facebook. 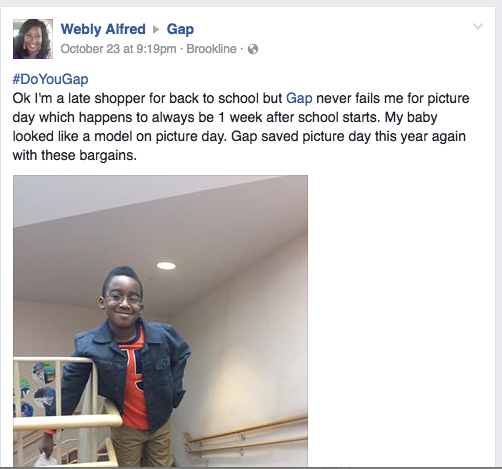 I used one of Gap’s popular hashtags, and I tagged their page in the post. They responded by tagging MY fan page and mailing me a “Thank You” gift card. Now THAT is how you keep customers coming back for more, and that is also an unexpected way to improve your Facebook engagement! Use something SUPER motivational and invite your followers to participate because this will help generate a significant amount of comments, likes, and shares. 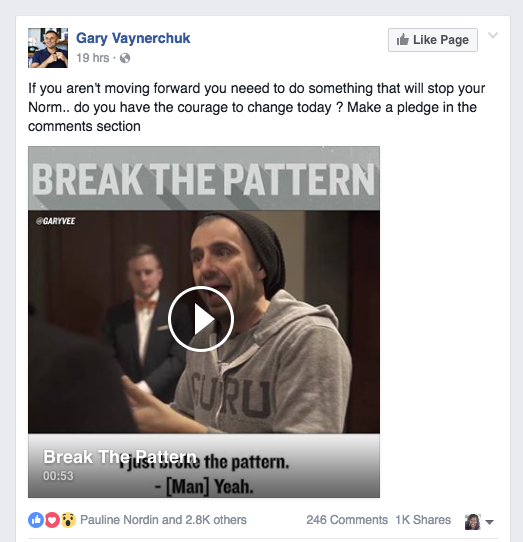 Once, Gary Vaynerchuck used a clip of a video to answer a question he had gotten from a fan struggling to move forward in his business. Using this tactic, he connected with fans who had the same struggle. He encouraged them to “Break the Pattern” and move forward in their business. The post got 246 comments, and it allowed him to get a snapshot of some of the needs of his fans. 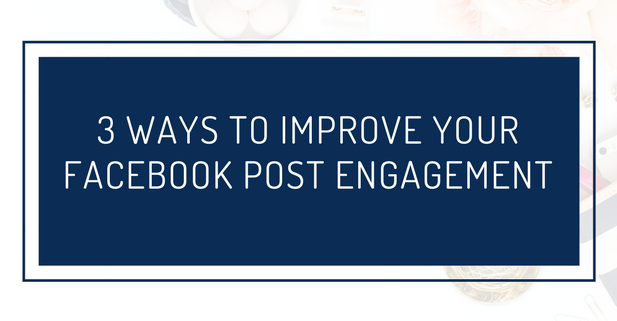 These are just a few of the ways you can improve your Facebook post engagement for FREE. I invite you to use them now. You can start building lasting relationships, extend your posts’ visibility, and learn more about your fans wants and needs. What do you think? How do you plan to create more Facebook post engagement? Please, share your thoughts! Hey Hannah, here’s an idea. Content is kind of like a conversation. I know you’re in business because you like what you do. Talk about it via content. I know I need to do videos, podcasts, etc. I just haven’t mustered up the wherewithal to do them yet! But it’s on my 2017 list. I love the shout out idea and I’m going to mull over how I might apply it to my spiritually-oriented social media. Thank you! Btw, your son really rocked that outfit! Thank you Reba. I love to shout out businesses, especially for great service. I am happy this one worked out in my favour unexpectedly. Thanks for my son’s compliment. Great customer service is becoming so rare it makes experiencing one very refreshing. Glad that this was of value to you. I like your ideas and that you offer some unique ones. I am going to give 2 of them a try. Thanks! That’s great Teresa. Let me know how it works out for you. You’re right about giveaways especially if the prize is a really good one. Giftcards go out really fast. Love that video is really gearing people to be more themselves on social media. Thanks for sharing Sonya! Because I personally very rarely watch videos on FB, I guess I am a bit reluctant to actually make them and ask others to watch them. I LOVE the shout out to a favourite brand idea, as so often I email or let their customer service know when they’ve done something incredible! I see that when I do brand mentioned tweets on Twitter, often they retweet or thank me, but so far no offers of gift cards. For me, engagement and meaningful replies are what I seem to rely on, but I also love Gary Vaynerchuk’s idea and see how that could work in the health arena…what would people like to know, what problem do they want to solve. Thanks for the food for thought, Webly! I agree with you about using GaryVee’s approach in the health area. Many health coaches keep showing themselves doing exercises but the public wants to see what’s in it for them. Hope you try the other 2. Customer service should be easy since we shop for something weekly and most businesses are on social media today. A video and a call to action? That’s a good idea. I’ll work on finding unique ways to incorporate them! Thanks! Looking forward to seeing how you incorporate them Lenny. You got me! I definitely need to find new ways to increase my Facebook social engagement. I think videos will be a great start and I would like to repurpose some the videos I’ve already posted in my newsletter. Thanks, Webly. These are some great ideas, Webly. I know I need to do video more. I enjoy it when I do it, I just need to do it. I guess my hesitation is in part because I don’t like watching other people’s videos. thanks for these suggestions. I have found that video clips (especially the shorter ones get lots of engagement. And they are fun to create. I had not done a shout out to a local business but am going to try this. 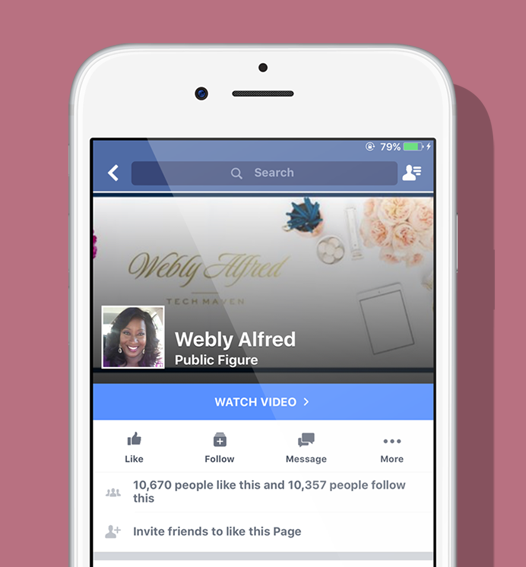 Loved this tips for getting more engagement on your FB fanpage, Webly! I need to work on doing more videos…..Thanks for sharing! Videos are a great idea Joan. Looking forward to watching you live on Facebook. Excellent tips Webly. I love doing videos in my blogs to help explain.. it’s always well perceived. Great tips about tagging brands too, since we can’t tag people. Great ideas and I love how Gary took a question from one person and used it to help so many more! I love the idea of videos to solve problems on Facebook. Such great stuff here. Glad this information was useful to you Renee. I would take that Gap gift card anytime! These examples you gave are quite powerful. I am looking forward to applying them now that you have featured the pros.